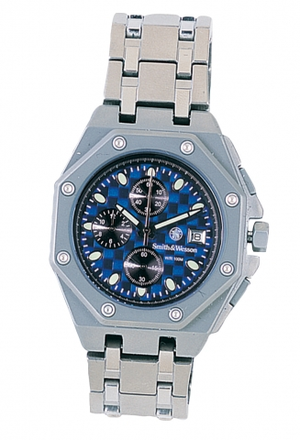 S & W Mens Titanium Chronograph Blue Face. Features precision Japanese quartz movement, titanium case and band, second hand, date, 30 minute timer, 1/10 second timer, 60 second timer, start/stop push button reset/split time, luminous hands and markers, lithium battery, and 100 meter water resistance. Comes in attractive metal gift box.